The Cincinnati Bengals and Pittsburgh Steelers were both fighting for supremacy in the AFC Central as they met on December 10, 1977. The Bengals, coached by Bill Johnson, had gotten off to a 2-4 start and were 4-5 before a three-game winning streak pulled them up to 7-5 and a chance to win the division. QB Ken Anderson, normally a precision passer, was having a less stellar year but was still formidable. 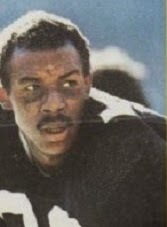 He was missing star WR Isaac Curtis due to a knee injury but second-year backup WR Billy Brooks (pictured above) was proving to be a good deep threat in his place and Pat McInally, the punter, was also effective in the other spot. Two ex-Ohio State stars, FB Pete Johnson and HB Archie Griffin, were the ball carriers. The Bengals had lost six consecutive games to the Steelers, including earlier in the season, and that made the difference in their placing second in each of the previous two years. Pittsburgh had won three straight division titles, and twice went on to win the Super Bowl. The Steelers were coached by Chuck Noll, who had broken his arm due to slipping on ice and falling the night before the game and was wearing a cast. It was symbolic of a season in which Pittsburgh, while still formidable, was having difficulties, getting off to a 4-4 start before also turning hot and winning four straight games prior to the rematch with Cincinnati. There were off-field distractions that seemed to affect the club’s performance, which showed in the offense turning the ball over with greater frequency and the defense giving up more points. It was a bitterly cold Saturday for the game at Riverfront Stadium with temperatures down to single digits. Attendance was low at 36,133, with 23,518 no-shows. While the sky was clear, the artificial surface was frozen and in poor condition. 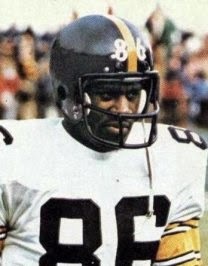 The Steelers had the game’s first possession, but on their third play CB Lemar Parrish intercepted a pass by QB Terry Bradshaw and returned it 47 yards for a touchdown. Chris Bahr added the extra point and the home team had a quick 7-0 lead. On the next series, and following a holding penalty on the kickoff return that had the Steelers starting from their 12 yard line, HB Rocky Bleier fumbled and the Bengals gained possession at the Pittsburgh 7. However, Cincinnati came up empty when, facing fourth-and-goal at the one, Pete Johnson was stopped short of the goal line by linebackers Jack Ham and Jack Lambert. The teams exchanged punts before the Bengals, starting from their 29, drove to the Pittsburgh 20. A pass interference penalty on a third-and-eight play gave Cincinnati 17 yards as well as a first down and Ken Anderson threw to TE Bob Trumpy for a 13-yard gain. But Bahr’s 37-yard field goal attempt was wide to the left and yet another scoring opportunity was for naught. The Steelers were driving as the opening period drew to a close. Bradshaw completed a pass to TE Bennie Cunningham for 22 yards and FB Franco Harris ran effectively. On the first play of the second quarter, Harris picked up the last five yards for a TD and Roy Gerela’s point after tied the score. The Bengals punted after a short series and Pittsburgh put together another promising drive as Bradshaw completed passes to WR Lynn Swann for 17 yards and Cunningham for 23. But a holding penalty backed the visitors up and the series stalled at the Cincinnati 42, forcing a punt. Another Cincinnati punt was followed by another long possession by the Steelers. Harris rushed for 45 yards on six carries, Bleier had a 16-yard run, and Bradshaw completed two passes. A fourth down was converted when Bradshaw threw to Swann for 19 yards. With 51 seconds remaining in the first half, Gerela kicked a 32-yard field goal and Pittsburgh took a 10-7 lead into halftime. On the first series of the third quarter, the Bengals advanced into Pittsburgh territory, but an Anderson pass was intercepted by CB Mel Blount. The Steelers were forced to punt but got the ball back three plays later when Billy Brooks fumbled after catching a pass for 35 yards and CB Jim Allen recovered. Bradshaw completed passes to rookie WR Jim Smith (pictured at left), subbing for the injured Swann, on consecutive plays and the Steelers reached the Cincinnati 24 before Harris fumbled the ball back to the Bengals. Anderson immediately threw to Brooks for a big gain of 57 yards and, after the series stalled at the Pittsburgh seven, Bahr tied the game with a 24-yard field goal. On the ensuing kickoff, Smith fumbled on the return and Anderson again went to the air on first down, connecting with Pat McInally for a 43-yard touchdown. Bahr added the extra point to put the Bengals, who had scored ten points in just 18 seconds of playing time, ahead by seven points. Early in the fourth quarter, the Steelers had a promising series following a Cincinnati punt. Bradshaw threw to Smith for a 27-yard pickup and a personal foul on the Bengals following a completion to WR John Stallworth gave Pittsburgh a first down at the Cincinnati 20. But Harris again fumbled after catching a short pass and CB Ken Riley recovered to end the threat. With just under ten minutes to play, the Bengals put together another good drive. Anderson threw to McInally for 21 yards on a third-and-seven play, Johnson had a 17-yard run and Archie Griffin a 13-yard catch on a screen pass and 15-yard carry in a second-and-13 situation. But the Bengals couldn’t gain any further ground after reaching the Pittsburgh six and Bahr’s 24-yard field goal attempt hit the right upright and was no good. A three-and-out series by the Steelers was followed by a Cincinnati possession that ended with Griffin fumbling and FS Glen Edwards recovering at the Pittsburgh 21. With the clock down to 1:51, Bradshaw threw to Harris for a gain of 17 yards and to Stallworth for 20 yards to the Cincinnati 40. But a sack by DE Gary Burley lost seven yards and, while an offsides penalty on the Bengals regained five yards, Bradshaw was unable to complete any more passes. A fourth-and-12 throw fell incomplete to clinch the 17-10 win for the Bengals. Cincinnati had the edge in total yards (413 to 362) although the Steelers accumulated more first downs (21 to 17). Pittsburgh turned the ball over five times, to three suffered by the Bengals, and the Steelers were penalized 11 times, at a cost of 95 yards, to five flags for 55 yards thrown on Cincinnati. Ken Anderson was successful on 15 of 33 throws, but they generated 303 yards and he had a touchdown as well as an interception. Billy Brooks caught 6 passes for 166 yards and Pat McInally (pictured at right) contributed 71 yards on three receptions that included the game-deciding TD. Archie Griffin topped the Bengals with 61 rushing yards on 13 carries and added another 31 on four catches. Pete Johnson had 51 yards on 15 attempts. For the Steelers, Franco Harris rushed for 101 yards in the first half, but was held to minus-six yards in the second and ended up with a net of 95 yards on 25 carries that included one touchdown. Terry Bradshaw completed 20 of 39 passes for 246 yards and had no touchdowns while giving up one interception. Four receivers caught four passes apiece, with Jim Smith gaining 80 yards on his first four pro receptions (although he also had the critical fumble on a kickoff return) and Bennie Cunningham generating 64 yards on his four. “We beat them, and we beat them right,” exclaimed a jubilant Coach Johnson to his celebrating players in the locker room. The win put Cincinnati in the driver’s seat in the race for the AFC Central title, but the Bengals failed to cash in when they lost to Houston in the season finale. They finished at 8-6, falling to third place. Pittsburgh ended up on top at 9-5 with a win at San Diego. The Steelers were ousted by Denver in the Divisional playoff round. Billy Brooks caught 39 passes for 772 yards (19.8 avg.) and four touchdowns in what was the most productive of his five NFL seasons. Pat McInally had 17 receptions for 258 yards (15.2 avg.) and three TDs. He also punted 67 times for a 41.8-yard average. Jim Smith had no more pass receptions for the Steelers in ‘77, being used almost exclusively on kick returns in his rookie season. He would go on to catch 110 passes for 2075 yards and 24 touchdowns in six years with Pittsburgh before departing for the USFL.